KoopaTV: Travel Beyond Alola in Pokémon Ultra Sun and Ultra Moon! Travel Beyond Alola in Pokémon Ultra Sun and Ultra Moon! By LUDWIG VON KOOPA - ...Not to any familiar region, but to creepy wormhole places. Forget walking through a series of varied natural environments with a Pokémon at your side (or stuffed in a Poké Ball attached to your belt). Pokémon Ultra Sun and Pokémon Ultra Moon want you to ADVENTURE THROUGH AN ULTRA WORMHOLE while riding on a legendary Pokémon. I guess that's taking Ride Pokémon to the next level? Here, watch the trailer that The Pokémon Company International released and this will make more sense. Maybe. You can travel to where the Ultra Beasts natively live and battle/capture them. I'm irritated by the implicit double standard: When Ultra Beasts go and invade Alola from their world, it's considered a massive crisis and the humans that allowed such wormholes to be opened are villainous criminals. When humans go and invade the Ultra Beast world from Alola, it's considered a game feature and an awesome opportunity. As far as I'm concerned, both invasions threaten the local ecosystems and are bad for the environment, and everyone should leave each other alone and stop going through wormholes. Fortunately, I think this new group of four people (two per version) called The Ultra Recon Squad agrees with me. They're from the Ultra Beast world (which may or may not be called Ultra Megalopolis) and they want answers on what the hell is going on. 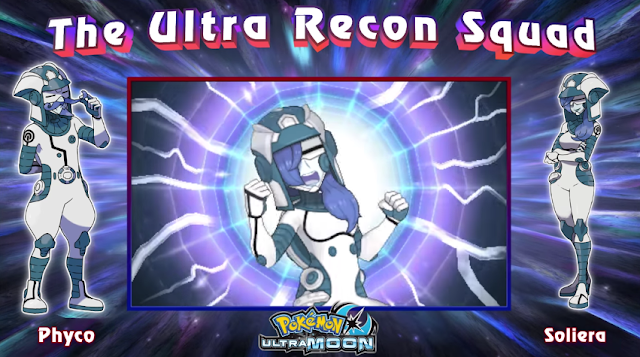 The Ultra Reconners also have brought an ecoterrorist of their own, the Ultra Beast codenamed Adhesive. It's a Poison type and very dangerous to humans and Pokémon. ...Okay, so maybe they don't care about my ecosystem concerns and are actually contributing to their destruction. Bummer. Let's talk about two other Ultra Beasts exclusive to the Ultra Sun and Ultra Moon alternate universe. Left: UB Burst (aka ISIS). Right: UB Assembly (aka THE WALL). Exclusively in Pokémon Ultra Sun, there is the Ultra Beast code-named UB Burst: A Fire/Ghost monster that is known for blowing itself up. It's basically an ISIS Jihadist. Its signature attack is called Mind Blown, which is something that ISIS regularly tries to do as a terrorist organisation by surprising us with their brutality. Believe me, we know about ISIS's explosive brand of barbaric terrorism first-hand. UB Burst is part Ghost because, like any other Jihadist, they're dead after their suicide bombing. Someone mentioned to me that UB Burst resembles a clown, and I think that fits into the UB Burst equals ISIS narrative I have going. Depicting ISIS members as clowns is a pretty good way to demean them, especially since President Donald John Trump denounces them as losers. Besides, clowns are horrifying as-is. Speaking of President Donald John Trump, the Ultra Beast exclusive to Pokémon Ultra Moon is code-named UB Assembly: A giant 18-foot tall Rock/Steel WALL. I'm not sure that 18 feet will be tall enough to keep Mexicans and terrorist thugs like UB Burst out, but there you go. Curiously, for all of the people who bash President Donald John Trump's WALL as something that can easily be tunneled through, UB Assembly has a 4-time weakness to Ground attacks, such as Dig. I'm still hoping that Hau gets killed off in this game, regardless of what version you play. Despite continuing coverage of the game, Ludwig still doesn't want to buy Pokémon Ultra Sun or Pokémon Ultra Moon, though if he had to pick one, it would be Ultra Moon because of THE WALL. Erm, Ultra Beast Assembly. ...What do you think? Despite inter-world immigration and what appears to be a flashier story, Ludwig STILL isn't excited. UB Assembly is a great example of how some Pokémon are becoming less and less monster like and more like inamnimate objects. It doesn't even resemble anything close to what could be considered a living creature, which I believe was foundational for the first few generations of Pokémon. Voltorb is a Pokéball come to life. The very first Rock-Pokémon Geodude and Graveler were basically living Rocks. Rocks! That is as inanimate an object as it gets. Pokémon based on inanimate objects were there since the very beginning. I've carefully avoided identifying Ultra Beasts as Pokémon throughout KoopaTV's pages, as well as anywhere else you might see me. I think the Pokédex identifying them as Pokémon is a mistake in terms of lore, and they should've maintained the non-human, non-Pokémon identification for Ultra Beasts that was from the beginning. So I'm pleased that Ultra Beasts generally look nothing like Pokémon. I suppose that you have a point. These new designs just seem so out of place to me. Well, how about the new designs that are actual Pokémon? Game Freak is promoting Lycanroc big-league. I don't like it, but you can't say it doesn't fit in with your notion of what a Pokémon is.